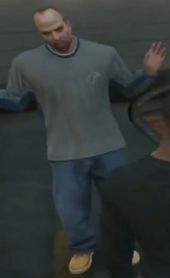 Chad Mulligan is a character in the HD Universe who appears as a minor character in Grand Theft Auto V. His voice actor is not credited. Chad Mulligan is, by 2013, a wealthy record pop music producer living in Los Santos. He had success in his early career but, after developing a lavish lifestyle, his career began to slow, having had no recent number one singles. He had gathered collections of rare cars (including a black Z-Type), pieces of art, wine and watches, while also purchasing two boats, some exotic pets, a ski lodge and a troupe of performing dwarfs. In 2008 he married Shanice but rumors of an affair with Lacy Jonas persisted throughout 2012, with the two separating in 2013. He had been arrested by the Los Santos Police Department on at least two occasions for speeding. His recent list of clients include the Blue Brothers (Billy and Bobby), Lacey Jonas, Softly Softly Catchy Monkey and Samantha Muldoon. The possibility of losing a number of his assets led to Mulligan hiding a number of them, including his black Z-Type, which is later discovered by billionaire businessman Devin Weston and his assistant Molly Schultz. Weston sends Franklin Clinton and Trevor Philips to steal the car with the two locating him, using a police helicopter, talking to Karina Pearl. They follow him to a garage and, after a chase, confront Mulligan with Franklin pointing a gun at his head. Mulligan flees and his car is stolen, later being delivered to Weston at his personal hangar at Los Santos International Airport. He later bleets about his car being stolen, asking for his car to be returned. Chad Mulligan can be killed by Franklin Clinton during the mission Eye in the Sky, and Weazel News will report that Mulligan was murdered. A post-mission bleet, however, shows that he is intended to survive the mission. This page was last modified on 30 September 2014, at 19:51.